The world’s indigenous languages are under threat of disappearing, with one language dying every two weeks and many more at risk. 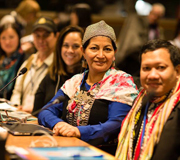 To address the question on how to maintain the roughly 6000 indigenous languages, UN DESA’s Division for Social Policy and Development (DSPD), Secretariat of the Permanent Forum on Indigenous Issues, organised an expert group meeting on indigenous languages on 19-21 January in New York. Ms. Daniela Bas, Director of DSPD, referred to the newly adopted Sustainable Development Agenda which aims at leaving no one behind, emphasising that it is also critical to not leave any language behind. The revitalisation of indigenous languages is essential for ensuring the continuation and transmission of culture, customs and history, but it is also important to address biodiversity loss and climate change. “Saving indigenous languages is crucial to ensure the protection of the cultural identity and dignity of indigenous peoples and safeguard their traditional heritage,” said Professor Megan Davis, Chair of the Permanent Forum on Indigenous Issues. A wide range of linguistic experts, indigenous peoples, representatives from Member States, the United Nations and other stakeholders gathered at the meeting. They shared numerous examples of good practices to keep languages alive, highlighting the crucial function of intergenerational transmission, the particular role of indigenous women, and the importance of mother tongue education. “The language represents the way of thinking of a people,” said Francisco Cali Tzay, Chair of the Committee on the Elimination of Racial Discrimination (CERD). The meeting especially focused on indigenous peoples’ initiatives to revitalize indigenous languages through information and communication technologies, such as using WhatsApp, online karaoke songs, social media, web tools in indigenous languages. The importance of languages cannot be undervalued. “It is the preservation of invaluable wisdom, traditional knowledge and expressions of art and beauty, and we have to make sure that we do not lose this”, Lenni Montiel, UN DESA’s Assistant Secretary-General for Economic Development concluded in the closing remarks highlighting the urgency to act. The final report and recommendations from the meeting will be presented to the Permanent Forum on Indigenous Issues at its May 2016 session.